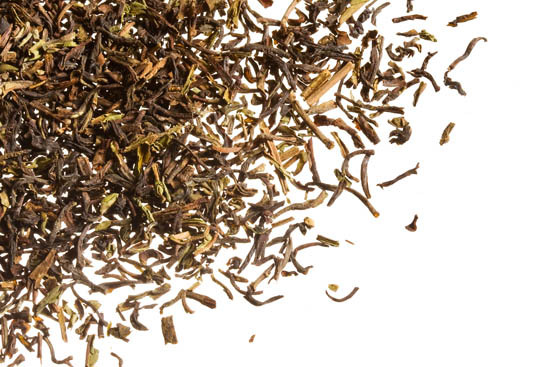 Where to Buy: Q Leaf Tea / Monterey Bay Spice Co.
Q Leaf Decaf Exclusive Black is a wonderful full-body, malty, rich whole-leaf black tea. Enjoyable any time of day, served hot or iced. Our carbon diozide decaffeination process is considered the best for decaffeinating tea. Fair Trade Certified, Q Leaf Decaf Exclusive Black Tea is also Certified Organically Grown and processed at the Fatikcherra Tea Estate in northeastern India near Assam (a Sanskrit word meaning peerless.) The impressive Brahmaputra River flows through the Assam, a land well known for teas, rainfall (up to 150 inches per year) and for populations of wild tigers and rhinocerous. The climate is humid with extreme rainfall March to May, monsoon season mid-June to September, and a cold season October to February. Recorded histories of the area survive from the 4th century BC, including its mention in the Hindu epic Mahabharata and other ancient Sanskrit writings. As I’ve stated before, decaffeinated teas scare me. I had a couple of really bad experiences in the past with decaffeinated teas, and since that time, whenever I come across a “decaf” tea – I cringe! But, the truth is, I’ve come across quite a few decaffeinated teas in the past couple of years that have been really outstanding! In fact, this one is so good that if I hadn’t known that it was decaf, I would not have guessed it. This is a very rich and flavorful tea, with a pleasant body. It does not come across as a thin or “reduced” tea in any way, nor does it have that funky aftertaste that sometimes accompanies a decaffeinated tea. It has a strong, malty quality that is baked and even a little chewy! It’s really delicious! Because it is a decaf, that means that I can enjoy it now, even though it’s quite late in the evening without worrying about it keeping me from getting a restful night’s sleep. And because it is 100% Certified Organic and Certified Fair Trade, I can sleep well knowing that the tea I drank this evening was socially and environmentally responsible!